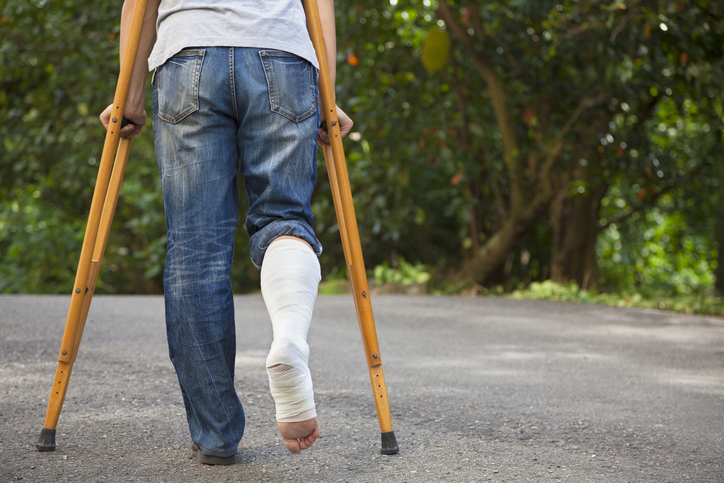 A crutch is a support to assist a person in walking, with a crosspiece at one end to fit under the armpit, and which is normally used when someone has broken or injured their leg. A forked support for anything can also be called a crutch and, figuratively, so can anything that is used for emotional or psychological support. When Aaron broke his leg, he had to use crutches. The apple tree's branches had so much fruit on them, we had to use forked sticks as crutches to prop them up. When her husband left her, Kate started using alcohol as a crutch. Crutch can also be the place where a person’s legs join their body, but this is now normally spelled and pronounced crotch. As a nautical term, a crutch can be either a forked support for a boom or spar (poles used on the mast of a ship) when not in use or a forked support for an oar on the side of a rowing boat. Crutch, meaning ‘a support for walking with a fork or cross-piece that fits under the armpit,’ dates back to before the year 900, as the Old English noun cryce or crycce (pronounced “crutch,” but with your lips forming a tiny circle for the u), which could originally mean ‘staff’ as well as ‘crutch,’ and later became the Middle English crucche. It can be traced back to the Proto-Germanic krukjo, though its origin before then is uncertain. Crutch is related to the Old Saxon krukka, the Middle Dutch crucke, the Dutch kruk, the Norwegian krykka, the Danish krykke, the Old High German krucka and the German Kröcke (all meaning ‘crutch’), as well as the Old Norse krokr (hook), the Italian gruccia (crutch) and crocco (hook), and the English word crook. Crutch has been used figuratively, meaning anything used as a support, since around the year 1600, and as a verb (though very rarely), since the mid-17th century.